Necessity is the mother of invention and that tells how iReveal was created. We, at Revalsys manage multitude of devices/website which includes – Firewalls, Switches, Databases, Websites, Servers, Routers, AD, eMails, Desktops …. Ensuring and monitoring the health status scrupulously was a huge responsibility on our shoulders. Staying precautious and pro-actively looking into every device minutely and quickly acting on any suspicious activities or unexpected behaviors have turned to be our day-to-day challenges. With the possibility that a network issue can raise in any part of the network, every device needs to be monitored with their corresponding tools. However, toggling between several tools and further working on raising tickets or alerts for the faults was very cumbersome. To do a cumulative report generation or performance analysis was another bigger challenge. 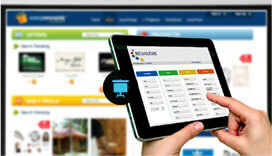 Revalsys could not find a comprehensive tool in the market that addressed the diverse needs. Further, when enquired about these challenges with others, the pain point was same. This motivated us to embark on the journey to build iReveal – a NMS and SIEM tool with the core focus on the users. A tool when plugged in any network – “Reveals” all the information. After a systematic road map design and careful integration of all the hardware, software and their communication through network protocol, the whole journey for the creation of iReveal started. Finally the fruit for every effort that went in the successful conversion for an idea to business was reaped, with iReveal tool which is a unified solution for Alert, Report, Monitor and Security Management. Being lightweight, easy to use and mobile compatible, iReveal has got integrated within it, all that it takes for managing your network securely.